Dislike the dry, tight and squeaky feeling after cleansing your face? That’s likely because your current cleanser contains soap and alcohol that strips skin of its natural moisture. 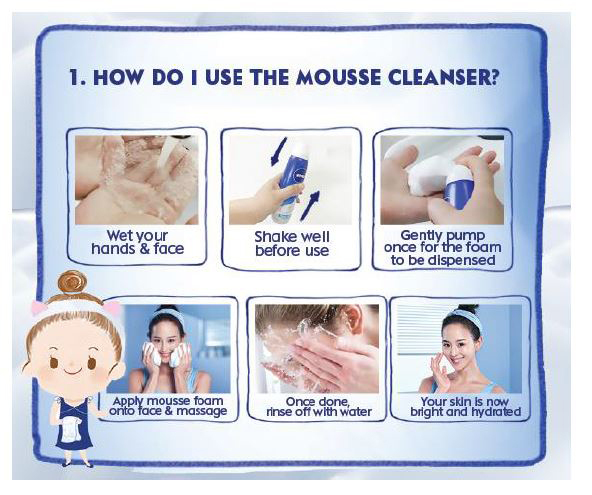 Introducing the 1st NIVEA Super Mousse facial cleanser with no soap and alcohol which cleanses deeply for smooth & hydrated skin after every wash! Suitable for Dull skin, contains Pearl Extract Serum which helps to brighten skin. Dense Micro Foam to reach deep within the pore for thoroughly cleansed & clear skin. Hydrates while cleansing with NIVEA patented Hydra IQ. Extra gentle on skin with NO Soap, Alcohol, Parabens, Silicone, Colorants & Mineral Oils. Know more about NIVEA on Facebook! a fairly gentle cleanser on the skin. the pump and mousse were fun but appeared to be more gimmicky. overall i feel pretty neutral about the product. Feel refreshing and moisturising after wash. No tight feeling on face. Deep cleanse effect. Face feel soft and clean.